Michael Conlan celebrates after defeating David Berna at The Theatre at Madison Square Garden on St Patrick's Day. 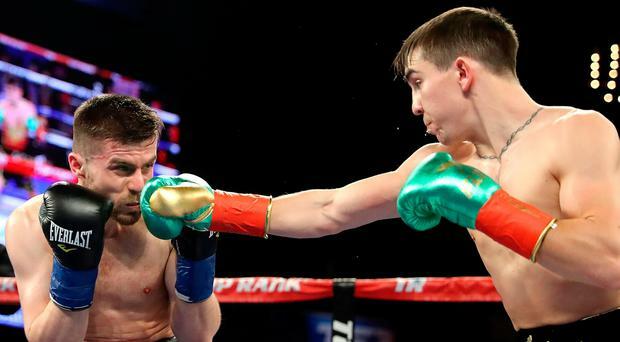 Belfast boxer Michael Conlan notched up an impressive second round victory over Hungary's David Berna at New York's Madison Square Garden on St Patrick's night. The former Olympic bronze medallist took his pro record to 6-0 with a technical knockout. He could have won inside the first round after sending his opponent sprawling to the canvas with a beautifully-timed shot to the solar plexus but Berna just managed to beat the count. At the beginning of the second round, the 27-year-old Hungarian went down for a second time and the referee decided to put an end to the fight. Conlan next fight is expected to be in Belfast in June.